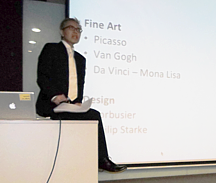 22 March 2013: George Hwang returned to the LaSalle College of the Arts today and delivered a talk on Intellectual Property (IP) and its implications for Fine Art & Design. This second talk was attended by art and design students. George made the distinction between Fine Art, which must comprise either just one creation or very limited editions as opposed to Design, which is replicable. Students learnt the difference between Intellectual Property and Industrial Property. They also learnt about the intricacies of Copyright and Registered Design, including the scope of protection afforded under each category and the considerations for commercialisation. They were advised to seek professional legal advice should they wish to take a holistic and long-term approach. For fine art, George drew attention to the concept of “droit de suite” or resale rights. This was a concept introduced in the European Union in 2001. Artists or their heirs have a right to a percentage of the resale price of the original artwork during the term of the copyright. Among the questions students raised was whether the creation of an artwork using another artwork as its subject is tantamount to infringement. George replied that this would depend on the specifics of fair dealing or fair use laws in that jurisdiction, and that one would also need to consider the commercial nature of such acts. For further information on protection of art and design, please contact George Hwang at george@georgehwangllc.com.